Medical excess has been recognised as a key problem in modern healthcare.1 2 3 4 5 6 7 8 9 Overdiagnosis and overtreatment have been identified in a wide range of diseases,4 10 and medicalisation of ordinary human conditions has been heavily criticised.11 12 We seem to do too much of a good thing. Technology tends to have a crucial role in our propensity to excess. No doubt, medical technology is a cornerstone in reducing ailment and improving health. Nevertheless, we need to address the challenges when the tool for improving health makes us diseased and when our means become our ends. Below I identify and analyse the mechanisms and the drivers behind using technology beyond its benefit and suggest measures to handle technology in a reflective and responsible manner. 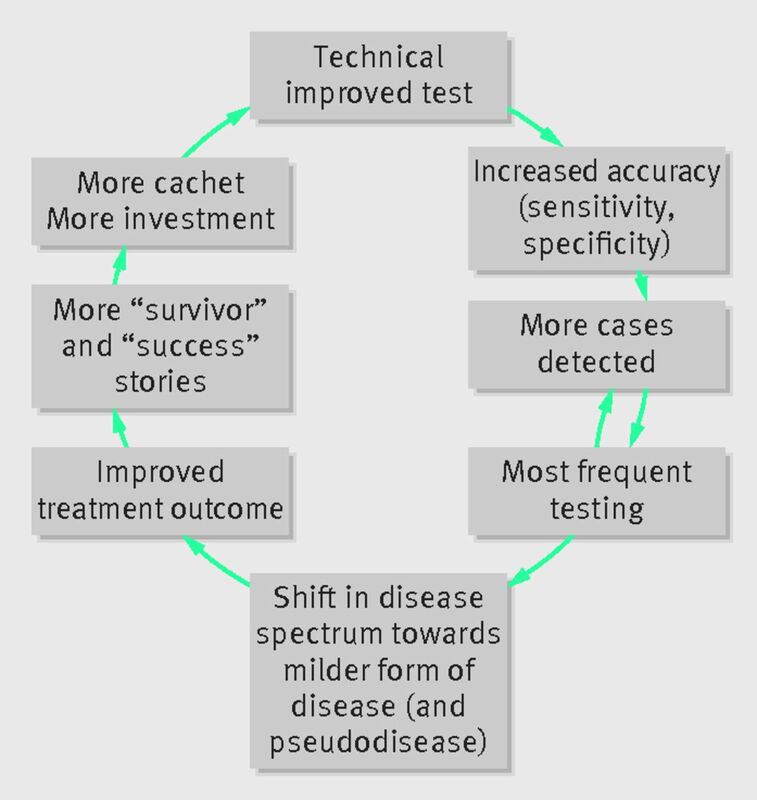 The pervasive use of technology in healthcare is driven by a positive feedback loop in clinical diagnostics (fig 1⇓). The expansion of diagnostic technology often starts with a technical improvement—for example, increased spatial resolution of a diagnostic ultrasound machine. Such advances in technical performance may not result in better diagnostics—we may only see better what we already know.19 But sometimes they result in increased accuracy, in terms of improved sensitivity and specificity.19 A shift from ventilation perfusion scintigraphy to computed tomography pulmonary angiography increases the accuracy in diagnosing pulmonary emboli, revealing more cases of pulmonary embolism.20 This is perceived as a success, which results in closer scrutiny of the images and more frequent testing, leading to detection of milder cases21 and a higher diagnostic yield.22 Computed tomography pulmonary angiography increased the detection of pulmonary embolism by 80% from 1998 to 2006.5 Hence, the technological improvement uncovers a hitherto “under-detected” health problem.1 5 This increases the notion of success and the interest in diagnostic technologies. Correspondingly, the increased number of diseased people spurs therapeutic attention. We start treating people who were previously not treated.18 Hence, ever milder cases are treated, as well as cases that would otherwise not have been detected. Computed tomography, magnetic resonance imaging (MRI), and ultrasound guided aspiration of thyroid nodules, for example, have increased the detection (and removal) of small papillary cancers.1 Treating milder cases improves outcomes, enhancing the impression of success, which in turn boosts technological innovation.18 Table 1⇓ gives some other examples where technology has changed the prevalence of disease. 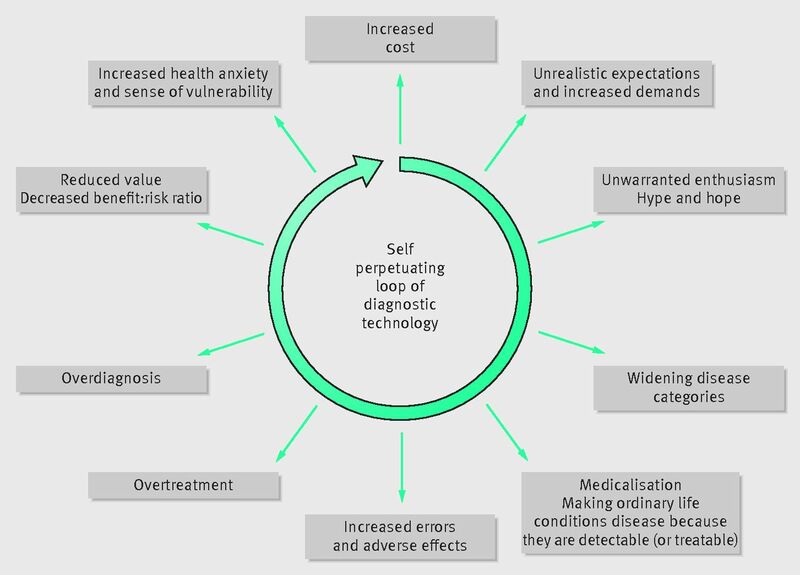 The self perpetuating loop of diagnostic technologies and the identified drivers are helpful in understanding and addressing the pervasive role of technology in healthcare. However, they miss a basic bond between medicine and technology: how technology constitutes our conception of disease. Technology is changing the meaning of disease.52 53 More specifically, technology changes our conception of disease at three levels.54 Firstly, it provides the entities that define disease. Technology such as biochemical analysers, cytometers, and DNA sequencers provides access to enzymes, T cells, or specific strands of DNA. Hence, the core elements of diseases we find in definitions in medical textbooks are constituted by technology. Secondly, it is directing and structuring our knowledge of disease. One day our knowledge of myocardial infarction is based on the electrical activity in the heart measured by electrocardiography, the next it is more based on measurement of troponin in the blood. Thirdly, disease is constituted by technology through practice. If we can measure or manipulate something, it tends to become a disease—for example, hypertension and cholesterolaemia would not be relevant to medicine if we could not measure or manipulate blood pressure or cholesterol. Hence, the expansion of technology profoundly extends our conception of disease—for good and for bad. Undermining trust—With increased awareness of excessive healthcare,7 9 53 low value healthcare,59 60 and “not to do” health services,61 people may lose trust—the cornerstone of healthcare provision. Although it is important to stimulate innovation we should restrain implementation. Only technology that has shown real benefit should be put into routine practice because access to technology is the most important determinant use in healthcare. 65 Technology assessment and transparent appraisal has to be strengthened to assure benefits for patients.42 Devices must be as critically assessed as drugs.66 67 Patients also need to be better informed about the uncertainties in benefits and risks of technologies, not only about the hyped gains. Their say should be acknowledged in the development, assessment, implementation, and use of technology. In order to use technology to help and not harm, we need to reflect and to take responsibility. To cultivate and boost its true benefits, we must avoid the allures and acknowledge the limits of technology.We must strive to bring our abilities to contemplate on the use of technologies to match our abilities to produce and use them. This will ensure we avoid becoming tragic heroes, succumbing as a result of our best endeavours. I thank H Gilbert Welch and two reviewers and the editor for their valuable comments and suggestions. Part of this research has been supported by the Commonwealth Fund through the Harkness Fellowship. The views presented here are not necessarily those of the Commonwealth Fund. Competing interests: I have read and understood BMJ policy on declaration of interests and have no interests to declare. Brito JP, Morris JC, Montori VM. Thyroid cancer: zealous imaging has increased detection and treatment of low risk tumours. BMJ2013;347:f4706. Moynihan R. Science of overdiagnosis to be served up with a good dose of humility. BMJ2013;347:f5157. Moynihan R, Glassock R, Doust J. Chronic kidney disease controversy: how expanding definitions are unnecessarily labelling many people as diseased. BMJ2013;347:f4298. Welch HG, Schwartz L, Woloshin S. Overdiagnosed: making people sick in the pursuit of health. Beacon Press, 2011. Wiener RS, Schwartz LM, Woloshin S. When a test is too good: how CT pulmonary angiograms find pulmonary emboli that do not need to be found. BMJ2013;347:f3368. Le Couteur DG, Doust J, Creasey H, Brayne C. Political drive to screen for pre-dementia: not evidence based and ignores the harms of diagnosis. BMJ2013;347:f5125. Moynihan R, Smith R. Too much medicine? BMJ2002;324:859-60. Richards P. Too much medicine? BMJ1999;318:268. Brownlee S. Overtreated: why too much medicine is making us sicker and poorer: Bloomsbury, 2007. Payer L. Disease-mongers: how doctors, drug companies, and insurers are making you feel sick: Wiley, 2006. Illich I. Limits to medicine. Penguin, 1976. Bodenheimer T. High and rising health care costs. Part 2: technologic innovation. Ann Intern Med2005;142:932-7. Prevention CfDCa. Health, United States, 2009 with special feature on medical technology. US Department of Health and Human Services, 2009. Dybczak K, Przywara B. The role of technology on health care expenditure in the EU. European Economy-Economic Paper 400. Directorate General for Economic and Monetary Affairs, 2010. Sorenson C, Drummond M, Bhuiyan Khan B. Medical technology as a key driver of rising health expenditure: disentangling the relationship. ClinicoEconomics and Outcomes Research 2013;5:223-34. Carrier ER, Dowling M, Berenson RA. Hospitals’ geographic expansion in quest of well-insured patients: will the outcome be better care, more cost, or both? Health Affairs (Project Hope)2012;31:827-35. Fisher ES, Welch HG. Avoiding the unintended consequences of growth in medical care: how might more be worse? JAMA 1999;281:446-53. Fryback DG, Thornbury JR. The efficacy of diagnostic imaging. Med Decision Making 1991;11:88-94. Burge AJ, Freeman KD, Klapper PJ, Haramati LB. Increased diagnosis of pulmonary embolism without a corresponding decline in mortality during the CT era. Clin Radiol2008;63:381-6. Moynihan RN, Cooke GP, Doust JA, Bero L, Hill S, Glasziou PP. Expanding disease definitions in guidelines and expert panel ties to industry: a cross-sectional study of common conditions in the United States. PLoS Med2013;10:e1001500. Black WC, Welch HG. Advances in diagnostic imaging and overestimations of disease prevalence and the benefits of therapy. N Engl J Med1993;328:1237-43. Cundy T, Ackermann E, Ryan EA. Gestational diabetes: new criteria may triple the prevalence but effect on outcomes is unclear. BMJ2014;348:g1567. Yudkin JS, Montori VM. The epidemic of pre-diabetes: the medicine and the politics. BMJ2014;349:g4485. Hoff G, Bretthauer M, Garborg K, Eide TJ. New polyps, old tricks: controversy about removing benign bowel lesions. BMJ2013;347:f5843. Provenzale JM, Sarikaya B. Comparison of test performance characteristics of MRI, MR angiography, and CT angiography in the diagnosis of carotid and vertebral artery dissection: a review of the medical literature. Am J Roent2009;193:1167-74. Welch HG, Passow HJ. Quantifying the benefits and harms of screening mammography. JAMA Intern Med2014;174:448-54. Herndon MB, Schwartz LM, Woloshin S, Welch HG. Implications of expanding disease definitions: the case of osteoporosis. Health Aff2007;26:1702-11. De Carvalho TM, Heijnsdijk EA, de Koning HJ. Screening for prostate cancer in the US? Reduce the harms and keep the benefit. Int J Cancer2015;136:1600-7. Loeb S, Bjurlin MA, Nicholson J, Tammela TL, Penson DF, Carter HB, et al. Overdiagnosis and overtreatment of prostate cancer. Eur Urol2014;65:1046-55. Sandhu GS, Andriole GL. Overdiagnosis of prostate cancer. J Natl Cancer Inst Mono2012;45:146-51. Hodgkinson J, Mant J, Martin U, Guo B, Hobbs FD, Deeks JJ, et al. Relative effectiveness of clinic and home blood pressure monitoring compared with ambulatory blood pressure monitoring in diagnosis of hypertension: systematic review. BMJ2011;342:d3621. Luks VP, Vandemheen KL, Aaron SD. Confirmation of asthma in an era of overdiagnosis. Eur Resp J2010;36:255-60. Appleby J, Raleigh V, Frosini F, Bevan G, Gao H, Lyscom T. Variation in healthcare. King’s Fund, 2011. Wennberg E. Tracking medicine. Oxford University Press, 2010. Lin GA, Dudley RA, Redberg RF. Why physicians favor use of percutaneous coronary intervention to medical therapy: a focus group study. J Gen Intern Med2008;23:1458-63. Augsburger JJ. Unnecessary clinical tests in ophthalmology. Trans Am Ophthalmol Soc2005;103:143-6; discussion 46-7. Gabbay J, Walley T. Introducing new health interventions. BMJ 2006;332:64-5. Pedersen T, Nicholson A, Hovhannisyan K, Moller AM, Smith AE, Lewis SR. Pulse oximetry for perioperative monitoring. Cochrane Database Syst Rev2014;3:CD002013. Ho C, Tsakonas E, Tran K, Cimon K, Severn M, Mierzwinski-Urban M et al. Robot-assisted surgery compared with open surgery and laparoscopic surgery. Clinical effectiveness and economic analyses. Canadian Agency for Drugs and Technologies in Health, 2011. Haas M, Hall J, Viney R, Gallego G. Breaking up is hard to do: why disinvestment in medical technology is harder than investment. Austr Health Rev2012;36:148-52. Henshall C, Schuller T, Mardhani-Bayne L. Using health technology assessment to support optimal use of technologies in current practice: the challenge of “disinvestment.” Int J Technol Assess Health Care2012;28:203-10. Fuchs VR, Sox HC Jr. Physicians’ views of the relative importance of thirty medical innovations. Health Aff (Project Hope)2001;20:30-42. Luft HS, Robinson JC, Garnick DW, Maerki SC, McPhee SJ. The role of specialized clinical services in competition among hospitals. Inquiry 1986;23:83-94. Hofmann B. When means become ends: technology producing values. Seminar.net 2006;2. http://seminar.net/index.php/volume-2-issue-2-2006-previousissuesmeny-114/66-when-means-become-ends-technology-producing-values. Album D, Westin S. Do diseases have a prestige hierarchy? A survey among physicians and medical students. Soc Sci Med2008;66:182-8. Wolf S, Berle B. The technological imperative in medicine. Plenum Press, 1981. Moynihan R, Heath I, Henry D. Selling sickness: the pharmaceutical industry and disease mongering. BMJ2002;324:886-91. Cassell E. The sorcerer’s broom. Medicine’s rampant technology. Hastings Center Report1993;23:32-9. Winner L. Autonomous technology. MIT Press, 1977. Hofmann B. Is there a technological imperative in health care? Int J Technol Assess Health Care2002;18:675-89. Davis A. Medicine and its technology. An introduction to the history of medical instrumentation. Greenwood, 1981. Boenink M. Molecular medicine and concepts of disease: the ethical value of a conceptual analysis of emerging biomedical technologies. Med Health Care Philos2010;13:11-23. Hofmann B. The technological invention of disease—on disease, technology and values. University of Oslo, 2002. Prasad V, Rho J, Cifu A. The diagnosis and treatment of pulmonary embolism: a metaphor for medicine in the evidence-based medicine era. Arch Intern Med2012;172:955-8. Brito JP, Gionfriddo M, Morris JC, Montori VM. Overdiagnosis of thyroid cancer and Graves’ disease. Thyroid 2014;24:402-3. Welch HG, Woloshin S, Schwartz L. Overdiagnosed: making people sick in pursuit of health. Beacon Press, 2011. Colla CH, Morden NE, Sequist TD, Schpero WL, Rosenthal MB. Choosing wisely: prevalence and correlates of low-value health care services in the United States. J Gen Intern Med2015;30:221-8. Collado M. How prevalent and costly are Choosing Wisely low-value services? Evidence from Medicare beneficiaries. Find Brief 2014;42(4):1-2. National Institute for Health and Care Excellence. NICE “do not do” recommendations. NICE, 2011. Heidegger M. The question concerning technology and other essays. Harper and Row, 1977. Hofmann B. On the value-ladenness of technology in medicine. Med Health Care Philos2001;4:335-46. Latour B. Reassembling the social: an introduction to actor-network-theory. Oxford University Press, 2005. Chernew ME, Jacobson PD, Hofer TP, Aaronson KD, Fendrick AM. Barriers to constraining health care cost growth. Health Aff (Project Hope)2004;23:122-8. Wilmshurst P. The regulation of medical devices. Unsatisfactory, unscientific, and in need of a major overhaul. BMJ2011;342:d2822. Dhruva SS, Bero LA, Redberg RF. Strength of study evidence examined by the FDA in premarket approval of cardiovascular devices. JAMA 2009;302:2679-85.